After reviewing all of the pedestrian accident data for the city, the overwhelming number of injuries involving pedestrians were related to inattentive drivers who either failed to keep a proper lookout or who misjudged people who were in the process of crossing the street. A significant component of pedestrian injury cases in Chicago were comprised of hit-and-run incidents where a driver fled the scene of the accident after striking a pedestrian. Compared to national traffic safety statistics between 2005 and 2009, people walking across the streets in Chicago were more than twice as likely to be hit by a car who fled the scene of the accident compared to their peers in other cities. A astounding one-third of all traffic accidents involving pedestrians were hit-and-run. 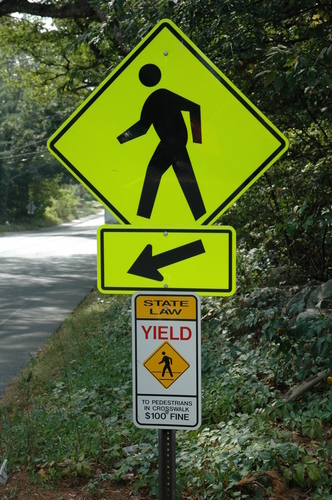 40% of all pedestrian fatalities were hit and run accidents, double the nationwide average of 20%. There was an average of two hit and run accidents a day that were either fatal or had a serious injury over the 5 year period. The traffic safety study also discussed 17 different driving actions that investigating police officers attributed to the crash. Topping the list was drivers’ failure to yield to a person in the street and turning within an intersection while a pedestrian was present. Failing to yield. The number one issue was motorists failing to yield to pedestrians. This action was listed as the primary reason for the accident in 48% of the crashes. Turning vehicles. At intersections with signals, vehicles that were turning accounted for the majority of crashes, especially within the ever congested Chicago Business District (CBD). 52% of these intersection accidents citywide were with turning vehicles, 60% in the CBD. Left versus right. Turning left versus right made up the majority of turning accidents, almost double within the CBD. Overall, left turning vehicles made up 35.5% of the crashes and right turning vehicles made up only 13.5%. These traffic crash studies clearly identify intersections as a number one hazard for pedestrians walking in congested areas like Chicago’s Loop. For drivers navigating city street, this study suggests that distractions such as cell phones and computers have no place driving through congested city areas. To those on foot on city streets, the traffic data should serve as a reminder of the obvious: city drivers may not always yield as they would assume. Being sure to follow traffic signals and pausing to make sure drivers see them are two important considerations to take into account while navigating the metropolitan area. Hopefully, as pedestrian injury statistics become more widely distributed, it will cause both drivers and people walking though the city take the extra precautions to prevent some of these incidents from occurring.